Finding the perfect holiday gift for the men in your life is most of the times way trickier than picking up a gift for a women. 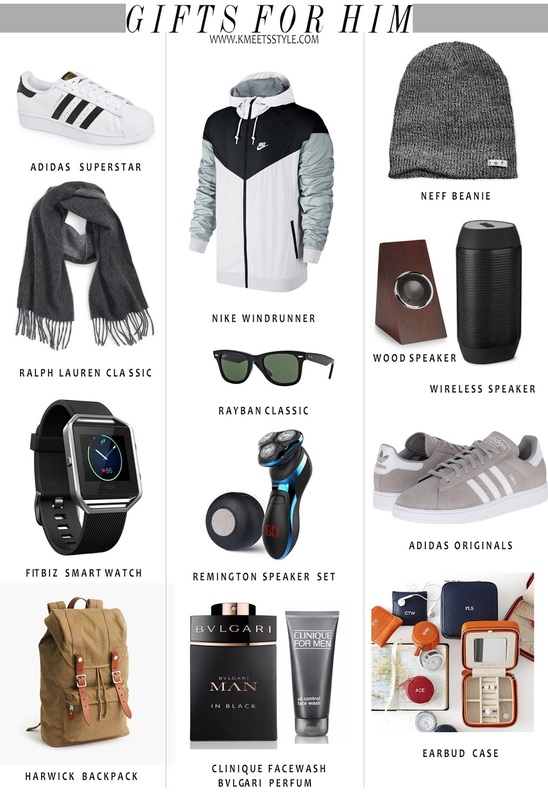 During this time of year I asked many of my guy friends and family members to suggest me a few gift ideas that would love to receive and as you can imagine I got more than enough answers to in order to make a gift guide collection. A great help was my love @kleiklis which kept adding and erasing my things from my gift list until he was completely satisfied with it. The athletic guy: We all have that one man that is always looking for the perfect pair of sneakers, a new fitness smartwatch or a quality jacket to keep him warm during his outdoors training. Nordstrom offers many Adidas designs, including the Adidas Superstar classic (under $80) in every size. Moving on to something warm, that almost every men will enjoy wearing this winter. The Nike Windrunner jacket (also available in blue here , in dark gray here and in black-red here ) which can be the ultimate outwear for every outdoors activity and casual looks. Last but not least, the Fitbit smartwatch fitness tracket (super affordable!) for IOS, Android and Windows. Everything casual : For the one that always prefers something comfortable for his daily walks, this Neff beanie can be easily combined with pretty much every outfit he might choose at any time of the day. Most of the guys I know love backpacks way more than messenger bags and the "everything casual" category is the perfect opportunity to add this Neutral colored Backpack to the list. It comes in many different colors but earthy tones are way more versatile for his daily style. Now that we are talking about versatility maybe you should thing about one of the most classic Rayban designs, Rayban Wayfarer( under $150) , a pair that can be loved by both men and women. The music lover: I know I should have added a pair or headphones, or earphones but most of the men I talked about this would rather like to have a new speakers set instead ( turns out most of them think that headphones are something they should choose by themselfs). If you have a strict budget this LMNT speaker is under $40 while this Wireless Light Up speaker is now on sale for 16$ (original price $54).